its integrated into one’s lifestyle. boldest of statements one can make. 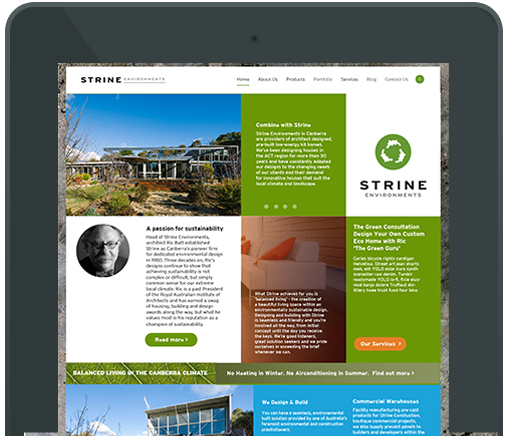 Helping my father’s renown green architectural business, Strine Environments in Canberra brings its many rewards. This project I decided to use almost a week worth of analytic and trend research to help form this strategy. Canberra is an ideal spot for green homes, as it has annual extreme variances in temperature from -6 degrees Celsius with snow to sometimes 39 degrees Celsius in summer and bushfires. Canberra and its greater regional residents are widely renown for being highly educated, tolerant, green and not only politically conservative, but also conservative of the environment and sustainable thinkers. 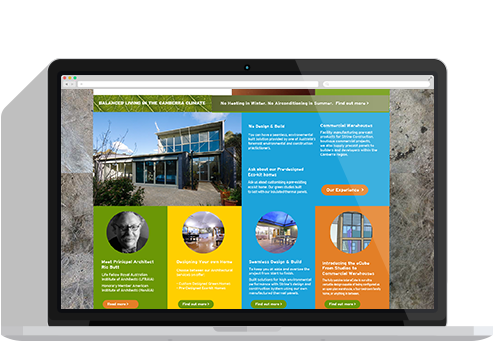 A user survey was constructed for Strine’s client list to determine the marketing channels found in contacting Strine, questions surrounding what was attractive with the brand, how they found the website, what were they looking for? How long were they looking for an architect and do they spread the good word. Word of mouth is easy in the building industry because you enter into someone’s home and its hard not to talk about your beautiful new dream home. Most potential customers spend 6 months – 2 years researching about building their dream home (the biggest buying decision for most people). An investment upwards of $400,000 AU. Most clients in the green sustainable home market have saved up half their life, this is a big deal. Its not just a product purchase here, its integrated into one’s lifestyle. This buying decision is the most boldest of statements one can make, the decision that they are sustainable, that they have class, that they worked hard for it and I know that these days well over 50% of big purchase power decisions are made by a female. Green is in – environmental is out. Sustainability is in. When looking at climate focus on cold climate, Australians look in June-August when cold. Kit home out seeds green builder/arch. More people look for builders over architects then kit homes. Cheap is more popular than green. But once inside green world it is a small percentage looking at cost. Green builder is more popular than green architect. The term architectural or architect isn’t so popular on keywords – but is a term sought after more against kit homes. A green builder is sought more than an architect. Polished concrete is a hot topic. Kit home then energy efficient then green then solar in popularity of terms. Quality is 25% of Kit home. Recommend: merging kit home/modular home with eco/green and run three campaigns, 2 x separate and 1 x merged. the terms kit home are 9 times more popular than modular. Architect designed prefab homes. Other trends found in keyword analysis: designer, new, sustainable, eco friendly, environmentally friendly, sustainable development, prefab homes, concrete Melbourne, concrete paint, new kitchen, passive solar, solar rebates, insulated panels, kitchen/concrete bench tops for more see Opportunities for Keywords after short tail graph. for house plans and floor plans 10 times more than designs. There does seem interest to target these short tailed searches kit home plans (489), modular house plans (210). “Small” modular homes is not a term Australians look for. Searching for environmentally friendly house (3600) is more popular to environment house plans (320) or materials (320). Some people can’t spell efficient and spell it efficient with 210 visits per month. Energy efficient design has 1000 and 12.3% of results coming from AU. While energy efficiency is a wide found term – once placed with homes/houses results drop. For instance; kit home (100,000) dominates eco friendly home (2,900), eco prefab home (1,600), prefab (12,000), energy efficient housing gets (720) from energy housing (1600). Aussies prefer eco “friendly” home (2900) to green home design (880) and green building design gets (590) yet more than houses on a global scale; 12,100 versus 6,600.
kitchen (49,500) is most sought after then bathroom (22,200) and bedroom (18,100), living room lacks due to complexity of details. 9,900 searches are for a “new” kitchen per month. Concrete polished has (14,800) searches. Kitchen bench tops (14,800) and kitchen concrete bench tops (1,900) shows that of bench top searches that 12.9% of Aussies are seeking polished concrete. Australians don’t say counter (720) they say bench top (1,600). Aussies love polished concrete bench tops. There is a small niche for concrete house design (210) and people searching Concrete designs (2,400). People prefer photos of bathrooms when researching and plans of kitchens. More people look for bathroom renovations than house renovations. Only 33.3% of people think to add the word improvement to their search – could target this word for narrowed market and greater results. While downsizing (110) might be a new market – second story had (390) per month. Feng Shui comes up 1900 as quite popular- potential article. Green living as well. 60,500 people are searching for homes retirement a month in AU. This is a massive result to head in. Retirement plans (8100) could also be targeted through Google ads or by adding house or home. 7,000 people from outside of Australia look at retirement options here in Australia, 14,800 people within Oz. Retirement lifestyle has 1600 another area to target ads.